Midfielder Josh Dunkley could spend more time in attack this season as the Western Bulldogs prepare to juggle their increased on-ball depth. A brief stint in the VFL midway through the year helped invigorate Josh Dunkley’s 2018 season. 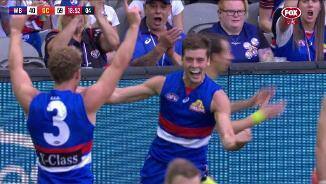 21-year old Dunkley played in the VFL between rounds 10 and 13, returning with the confidence to tackle some of the AFL’s biggest midfielders. In Round 16, Dunkley held eventual Brownlow Medallist Tom Mitchell, to 27 touches (collecting 23 of his own and laying 10 tackles) after the Hawks midfielder collected 50 disposals the week before against GWS. Dunkley amassed a career best 36 disposals in Round 22 against Carlton and averaged six tackles. An injury interrupted season for Josh Dunkley limited the 20-year-old to seven senior matches in 2017. Dunkley dislocated his shoulder in Round 7. He required a reconstruction, missing 12 weeks with the injury. In May, he agreed to terms on a two-year contract extension, keeping him at the Kennel until at least the end of 2019. He returned to football via the VFL in Round 20 and earned a senior recall the following week. Dunkley kicked three goals against Brisbane in Round 5. “Last year I had an ankle reconstruction so it was a delayed start to preseason and this year coming in for a few games and then (suffering) the shoulder injury didn’t help. “I missed another 12 weeks there. It was good to get back towards the end. 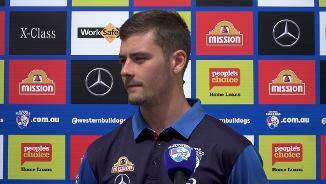 “A shoulder injury lowers your contact level, I couldn’t do a lot of the physical side of the game so I was doing a lot of kicking and skills work with Rohan Smith which really helped. 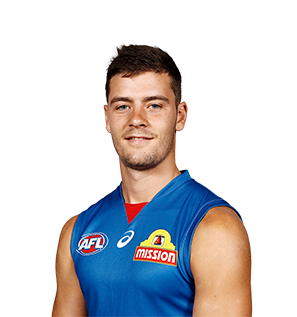 Recruited from the Gippsland Power, Josh Dunkley is a strong and courageous tall midfielder who is a prolific ball winner and a smart user of the ball. Is a very good mark overhead and can impact games as a forward. Outstanding leadership ability, and desire to compete at all times is a highlight. Injury interrupted his top age year of U18 football in 2015, but before that had an exceptional junior career. Dunkley is a contested weapon, with bucket loads of courage and excellent leadership potential. Clutch player who relishes big moments in games. In an outstanding debut season, Dunkley played 17 games, and received a NAB AFL Rising Star nomination in Round 20. 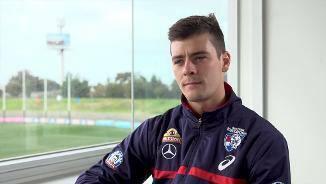 Dunkley was the youngest member of the Western Bulldogs' 2016 AFL Premiership side.